50 years ago there wasn’t the internet to turn to. When questions needed an answer on how to raise a child, you just ﬁgured it out. There was parent and child. There was instinct. And there was Tommee Tippee. For 50 years we’ve made products that are smart and simple, innovative and intuitive. For 50 years we’ve helped parents parent the way they were made to. In the 1960’s three brothers in California created a new baby cup and named it after their dog Tommee. 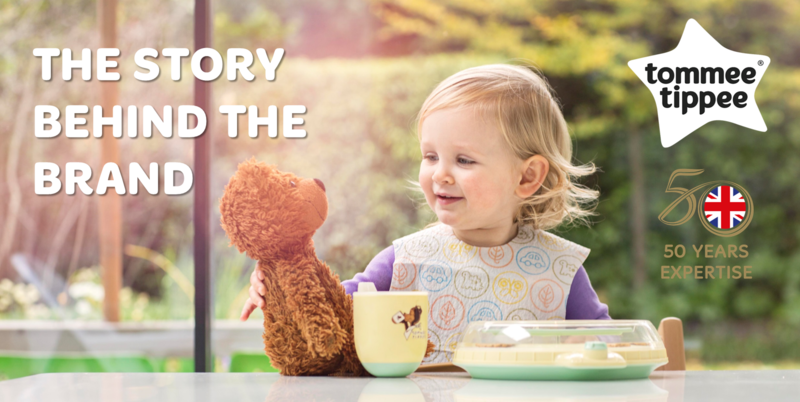 The cup was known for its weighted base which prevented it from tipping over – and tommee tippee® was born! A leading British businessman met the brothers on a trip to the States, loved the cup and brought the brand tommee tippee® and a handful of feeding accessories to the UK in the mid-sixties. The business man set up a manufacturing unit just north of Newcastle upon Tyne and within a few years tommee tippee® became the number one baby accessories company in the UK. The brand had hundreds of colourful, practical and innovative products for babies and toddlers to take them from birth to weaning and onto independent eating and drinking. Traditionally known for cups and tableware, our leading position was reinforced in 2006 with the launch of the award winning Closer to Nature®, a newborn feeding range, and in 2013 with the Perfect Prep™ machine that is now credited with revolutionising the baby feeding market.